ICE deportation form: Trump is making parents choose between losing their children and deportation. Signs are displayed during march and rally against the separation of immigrant families June 30, 2018 outside the detention facility of the US Immigration and Customs Enforcement in Los Angeles, California. The American Civil Liberties Union’s Lee Gelernt, the lawyer who won the nationwide injunction against family separation in the case Ms. L v. ICE, told me on Tuesday that he believes the form is being given to people with valid asylum claims—an assertion that lines up with NBC’s reporting. “The new instructions to agents do not allow parents who were separated from their children under President Donald Trump’s ‘zero tolerance’ policy to reunite with their children while they await a decision on asylum, a protection sought by thousands of migrant families fleeing violence in Central America,” the network reported. As Ben Mathis-Lilley has written in Slate, telling asylum-seekers they can get their children back only if they accept deportation appears to be a human rights violation. 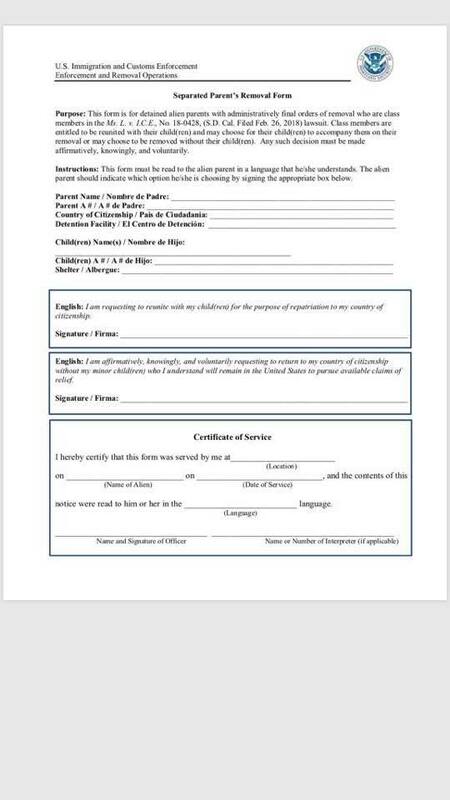 Most troublingly, Gelernt told me, the form is even being given to those immigrants who have passed initial “credible fear” asylum hearings before an immigration judge. In explaining his most recent order, Sabraw cited a previous ruling he’d issued saying that arbitrary family separation was a clear substantive due process violation. In that earlier ruling, Sabraw also said asylum-seekers had the right to “pursue relief extended by U.S. law.” Sabraw, then, has said that asylum-seekers have the right to family integrity and the right to pursue asylum claims under U.S. law. If they are only being given the chance to reunite if they accept deportation—as Gelernt claims is happening in some cases where applicants have passed an initial credible-fear screening—that would appear to be a violation of the intent of Sabraw’s rulings. Gelernt says that, despite the reports that lawful asylum-seekers are receiving this notice, he “hopes” that this is all just a bureaucratic mistake. Gelernt also told me that the ACLU is asking the government to immediately stop using the form, which cites Sabraw’s ruling as the reason for its binary offer. “We believe the form should simply say, ‘Do you want your child back or not?’ There’s no reason to combine it with the removal,” Gelernt said. Gelernt also told me that the ACLU would argue in an upcoming status-conference hearing in the case, scheduled for this Friday, that the government should stop using the form even in cases where deportation is pending after a failed initial asylum claim, as these families still have the right to appeal those claims. Those lawful appeals would be denied, Gelernt argues, if asylum-seekers were forced to choose between accepting deportation with their children or being separated from them.